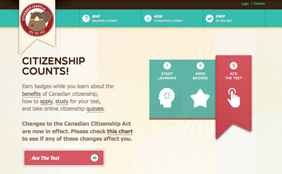 CitizenshipCounts.ca and DeviensCitoyen.ca are websites that help young newcomers learn about Canadian citizenship and study for the Canadian citizenship test. They make learning fun by issuing online "badges" based on what you've learned, and keep track of your progress. You can even share your badge on Twitter or Facebook, and compete to get the highest score on the online citizenship quiz. Although newcomer youth are given some formal education about their civic rights at school, and some understand the need and importance of becoming citizens, many youth are still unsure of the benefits of citizenship. In addition, young newcomers under the age of 18 may face inter-generational difficulties if their parents are unable or unwilling to apply for citizenship. There is a need for educational and engaging resources for newcomer youth to learn about why getting full Canadian citizenship is important, and providing resources to help them become Canadian citizens. This project is managed by OCASI and was funded by Citizenship and Immigration Canada (CIC).